We are all individuals. As such a funeral service should be a reflection of a person’s life – their loves, their achievements and the things that made them who they were. We ensure that the things that shaped you are incorporated into the funeral and the service. Music, hobbies, interests, poems, colours, beliefs, values, the things that you treasure. The way that you lived your life should be reflected in your funeral. The service can be religious, civil or humanist, semi-religious or spiritual with no named faith. Essentially it will be appropriate for that individual. You cannot say goodbye to a loved one properly in 15 minutes at a crematorium. We can get you the right time, space and environment to say farewell. 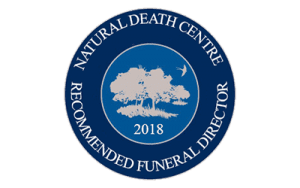 We have arranged funeral ceremonies in woodland burial grounds, fields, gardens, community halls, a pub, many private family homes and gardens, a barn, and a beautiful hotel. We can arrange motorcycle funerals, or football funerals at sporting grounds, or whatever is appropriate to you. You tell us where you want to be, we’ll sort out the logistics. “Natural Endings are the bees knees of funeral directors, and we need the bees (and their knees). When my husband died far, far too young I, and our children, wanted to celebrate his life not just mourn his death. Rosie was not phased by my tearful request for a fun funeral with a cardboard coffin. She was everything you could have hoped for. She knew a jazz band to play Stuart in and us out. Rosie took the trouble to give me time and space after the funeral and brought his ashes to my allotment on a sunny afternoon a few weeks later. Motorbike funeral photograph reproduced by kind permission of the Mottershead family, Wythenshawe.